EMU students took part in MLK Day of Service and Learning by helping remove trash and debris from Blacks Run in Harrisonburg. Photo by Jon Styer. Service and learning took center stage for Eastern Mennonite University’s expanded observance of Martin Luther King Day on Jan. 21. Some 200 students, faculty and staff participated in service opportunities and cultural learning tours. Photo gallery of day’s events (please be patient while it loads). A tour of historic Newtown in northeastern Harrisonburg introduced participants to the city’s original African-American community that was first settled by newly freed slaves. The tour included stops at the segregation-era Lucy Simms School, Bethel AME (African Methodist Episcopal) Church, Newtown Cemetery and Our Community Place, an anti-poverty organization. Students packed a black-owned barbershop in downtown Harrisonburg to interact with longtime barber Tyrone Sprague, who likes to mix his haircuts with lively conversation. Several students got a haircut. Other learning tours took students to Harrisonburg-Rockingham Free Clinic, Blue Ridge Legal Services, and the Center for Marriage and Family Counseling. 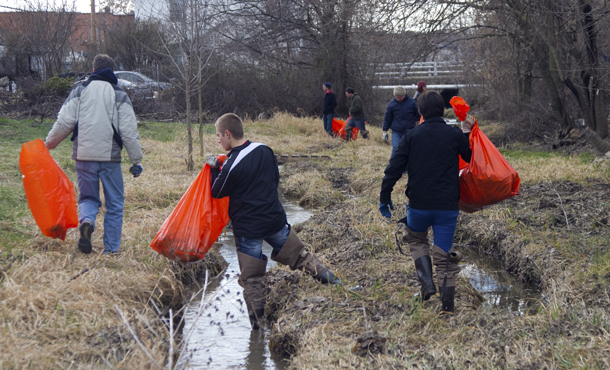 A group of students cleaned a stretch of Black’s Run, a stream that starts near the EMU campus and winds through Harrisonburg. They concentrated on the stretch through the northeast neighborhood. Other students helped prepare the weekly “community meal for everyone” at Our Community Place. One of the organization’s many ministries is a Monday meal for anyone who comes—homeless as well as non-homeless people. There is no distinction between the servers and those being served. The observance of King Day, a national holiday named for the legendary civil rights leader who was assassinated in 1968, coincided this year with President Barack Obama’s second inauguration. Obama, by personal example, has popularized service projects on King Day. Collaborating in the planning were EMU staff and student organizations as well as the Northeast Neighborhood Association and United Way of Harrisonburg-Rockingham County. EMU’s keynote speaker this year was Shane Claiborne, a nationally known Christian activist and best-selling author from Philadelphia. He spoke in chapel and led two forums, all three of which drew large crowds. In their fight for justice, though, Claiborne warned his listeners not to fight the people who disagree with them. Jesus interacted positively with all kinds of people on all sides of the issues, he said. “The revolution of God sets the poor and oppressed free while also setting the rich and powerful free,” he added. Claiborne is a founding partner of The Simple Way, a faith community in inner-city Philadelphia that has helped to birth and connect radical Christian communities around the world. His books include The Irresistible Revolution, Jesus for President and Becoming the Answer to Our Prayers. He travels extensively, speaking over 100 times a year about peacemaking, social justice and Jesus. Readings of King’s letter from the Birmingham jail that he wrote 50 years ago this spring after his arrest for anti-segregation activities—followed by discussion. “Mix-it-up” lunch with guided conversation in the EMU cafeteria with a mixture of people from the campus and community. Collection of items for flu prevention for Harrisonburg-Rockingham Free Clinic. Collection of health kit items and sturdy shoes for Our Community Place. Art exhibit on the civil rights movement, titled And Freedom for All. Coffeehouse conversation with a panel of Harrisonburg residents who remember King first-hand. Posted in Academics, Campus Community, Special programs, Student lifeTopics Day of Service and Learning, Martin Luther King Jr.